Maintenance is not always synonymous with airworthiness. Even well-intentioned technicians can fail to account for the relationship of the part to the whole. Neil Richardson’s cover story considers how insufficient knowledge, real or perceived commercial pressure, and borderline deviations based on personal experience can undercut a maintenance program that meets periodic inspection requirements. He offers suggestions about how organizations can close the gap between maintenance and airworthiness. 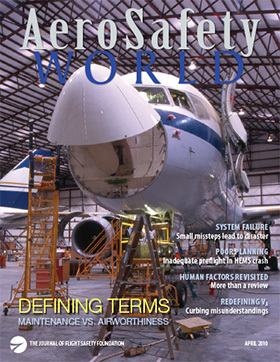 Also in the April issue: ICAO’s safety audits are shifting from scheduled inspections to continuing safety data monitoring; how a crew’s faulty approach profile and perhaps incorrect expectations ended in CFIT; dangerous misconceptions about operating an airplane at or below its design maneuvering speed; and how recurrent human factors training should differ from initial HF training. This requires a clear understanding not only of human factors but also of the basic concepts of, and relationships between, airworthiness and maintenance. ICAO will shift from periodic audits to a system based on continuous data-driven monitoring. After lengthy consultation and planning dating from mid-2008, which included input from many stakeholders in the process, a new concept was born — the Continuous Monitoring Approach. The goal is not to find blame when examining the relevant human behavior but rather to understand why the choices that were made by those involved seemed reasonable to them at the time. In accelerating implementation of the Next Generation Air Transportation System in the United States, the streamlining of risk analysis has emerged as one of several safety-related issues raised by 50 speakers and panelists at the recent RTCA Spring Symposium. The NTSB says a Bell 222 HEMS pilot’s inadequate preflight planning was responsible for his helicopter’s collision with a radio tower. Eurocontrol has approved a plan to fight airspace infringement — the unauthorized penetration of airspace, often by general aviation aircraft being flown under visual flight rules — which it characterizes as a leading operational risk in European skies. Recurrent training has long been a standard process in aviation, an attempt to make sure that skills once learned are retained and can be easily recalled when needed. In human factors, however, recurrent training raises more issues than the relatively straightforward initial training. Contrary to a common misconception among pilots, operating an airplane at or below its design maneuvering speed (VA) provides only limited protection against structural damage, according to the U.S. Federal Aviation Administration.